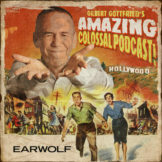 Historian, bestselling author and “King of Comedy Lore” Kliph Nesteroff returns to the podcast to serve up an all-new assortment of scandalous showbiz tales and to hold court on a host of essential topics, including Hollywood’s flirtation with fascism, the strange predilections of Bud Abbott and George Jessel, the mob’s iron grip on the nightclub circuit and the rise and fall of celebrity fast food franchises. Also, Stu Gilliam goes berserk, Rock Hudson “marries” Jim Nabors, Groucho runs afoul of the FBI and Kliph gets a surprise phone call from Steve Martin. PLUS: The Mad Russian! Mickey Rooney’s Weenie World! Hitler vs. the Three Stooges! Jerry Lewis pulls a gun! And Sammy Davis Jr. joins the Church of Satan!